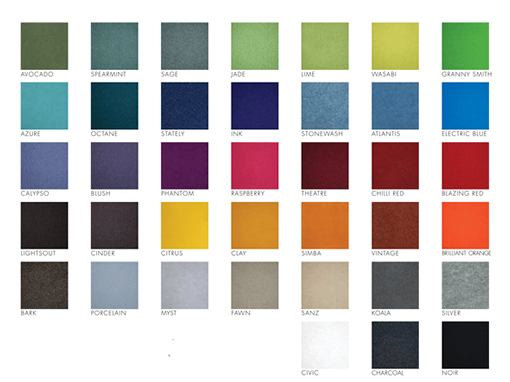 Autex Composition is a 10-12mm thick pinnable wall fabric that is Velcro receptive and has acoustic properties. It’s available in roll form and is often installed similar to wall paper however, it can be manufactured into a more traditional style of pinboard with an MDF backing and aluminium framing. The large range of colours (25) provides the freedom to create a custom look to suit your requirements and can be cut into various shapes and angles. Sizes: 25m x 1200mm wide rolls. Minimum order length 5m..